NatGeoTV plans to produce a program featuring Top Dog and the National Dog Agility League. This is not a series. But we are inclined to want to blow their socks off and make it very clear that it should be a series. The plan is for February of 2017 in conjunction with the events surrounding Westminster. In 2016 we will be marketing the league in earnest. NatGeoTV might be electrified by the support by the agility community. But we’ll have to demonstrate that we are capable of supplying that electricity. The format that I have envisioned all along is a competition between the two top franchises in the National Dog Agility League. That means that accrued scores for each club in 2016 will qualify the teams for the on-air competition. Play will be open to anyone in the world who wants to put up the course, utilizing basic social networking tools for the recording and aggregation of scores. In routine league play the team score for a franchise club is derived from the scores of their top five players. That gives a notable advantage to franchises with lots of dogs. The plan for the NatGeoTV segment will be that the teams must be selected in advance. In a “king of the hill” format the top franchise in 2016, based on earned LPP, will be the host. The runner-up gets to travel and challenge the Top Dog team on their turf. That sounds intimidating eh? At the same time any club anywhere in the world will be able to put up the challenge course and submit scores in the competition. For this one event we will require a YouTube link (to a recording which might wind up on the program). The YouTube data is optional in routine league play. League franchise clubs established in 2015 will be grandfathered. The October workbook for the final game of the summer series can be downloaded HERE. I spent this past weekend in Medford, Oregon. It was a marvelous experience with a group of fun and kindly folks. The first day was a handling seminar; and the final two days I spent judging. 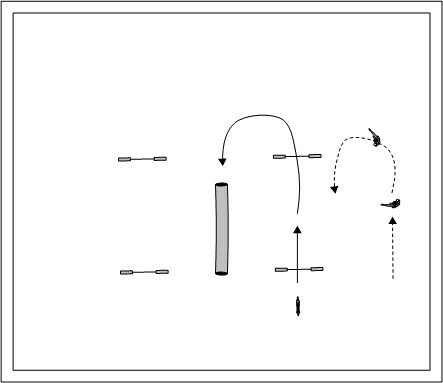 Below I’m going to share the basic training steps for teaching a dog a Tandem Turn. This was one of the exercises we did in the clinic. You must know that I consider the Tandem one of the basic tools of an agility handler. The dog turns most naturally toward the handler. So the handler should embark on a specific mission to teach the dog to turn away, because sometimes the course demands it. When teaching the Tandem I use a three-step methodology. This drawing shows the first step… what I call the intro step. Basically the handler just works near the dog and will arrive at the jump at the same moment of the dog, cue the turn and cross behind the dog. We do this over and over again until both the handler and dog understand the movement. I always must make a special point when showing this method, whether in class, camp or seminar… that we are now in dog training mode. That means that we must control the variables of the lesson for the dog. The most important details are: a) the handler should arrive at the jump at the same moment as the dog, and b) the handler will cross behind the dog. Before going to the second step I am looking for certain elements of performance. First of all, the handler should be making a clear signal and stepping behind the dog. Also, I look for the dog to turn readily away from the handler in the new direction of the course, in spite of the obvious fact that the course is going away from the handler’s position, rather than towards the handler. This runs contrary to the riddle of sides which suggests that the dog turns most naturally in the direction of the handler. The second step I call the lateral distance step. Now the handler should work a distance away from the dog’s path, but in a path parallel to the dog’s path. Many handlers are initially skeptical of the handler’s path compared to the dog’s path. But most dogs with even a modest basis of training will work happily a distance apart from the handler. This step works quite like the intro step. 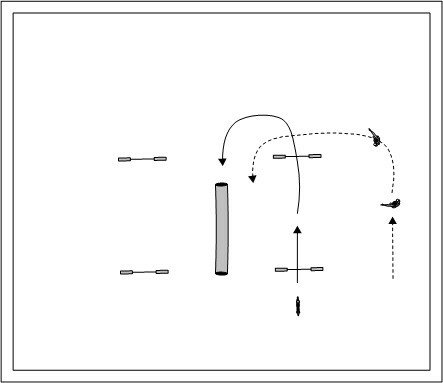 The handler should arrive at the corner of the turn at approximately the same moment that the dog arrives at the jump. Now the handler will have to move convincingly towards the dog as he cues the turn. What we are looking for in this step is a dog that sees the cue to turn and takes it. Most dogs will get around the jump and head for the next obstacle (the tunnel) even before the handler has crossed the face of the jump. Indeed, before going to the next step we want the dog to take the cue to turn and actually separate and accelerate away from the handler. In the final step, the proofing step the handler will once again work with a lateral distance from the dog’s part. The real difference now is that the handler won’t actually cross the face of the jump at the corner of the turn. Instead the handler will layer the line of jumps while the dog works away, into the pipe tunnel. A proofing step is important in any dog training objective. It is a step that allows the dog’s trainer to assess whether the dog really understands the object of the lesson. Some handlers will make an essential error in this step. While they might work a lateral distance apart from the dog… they won’t actually use it. 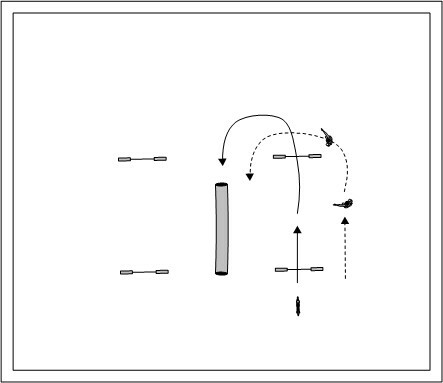 The purpose of the lateral distance is to give the handler room to move towards the dog and to sell the turn away. In retrospect teaching the Tandem was the wrong building block for this particular community of agility fans. I learned a lot more about them in two days of judging. What I really should have taught was the Riddle of Sides. As I said above “the dog turns most naturally towards the handler.” This is fundamental to the extent that I include the rule in the Laws of a Dog in Motion. But what I saw in the trial (when I was no longer in my teaching uniform) was a whole bunch of gratuitous rear crossing. The really excellent handler will put changes of side forward of the dog rather than behind. I appreciate having a rear cross for the emergency. But every single emergency should not be of the handler’s invention. Our classes are always based on the “league” game. Since the competitive league is a monthly affair, some of our classes will be based on a pickup game. 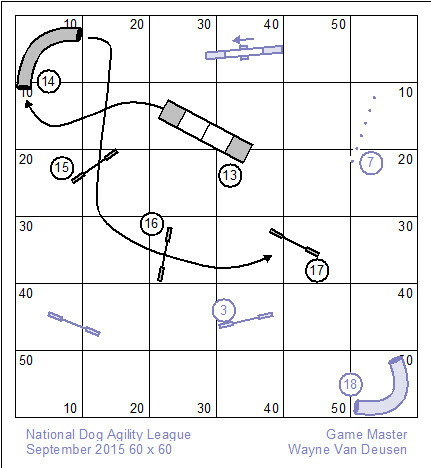 The course below is a National Dog Agility League game that was played about two years ago. I’m excited by the prospect of running this course again because a couple of our dogs and a couple of our student’s dogs ran it two years ago. This rerun allows us to compare a dog’s development over time. These days we video-tape all of our runs; and I’m pretty sure we don’t have the original runs recorded. And so even though we have time and scores, whatever errors of play or judgment we might have made then, are lost in the dust of time. But, since we are keen to record (and post on YouTube) these days; it might make an interesting comparison in maybe another two years. Any course or game that you play will have good material for teaching and practice. I’m pretty sure in the design of this course that I was preoccupied with how to give a turning cue to a dog heading into a straight pipe tunnel. Mind you I believe that the handler’s posture on making the presentation of a pipe tunnel cues the dog on how to make the dismount… whether to fire out of the tunnel as though out of the barrel of a cannon, or to bend neatly into a turn. If the handler is nowhere near the pipe tunnel as the dog goes in… then posture can’t be all that significant and the handler will have to rely on verbal cues. We’ll develop this line of thought more at class on Monday night. You are welcome to join us in playing this game. 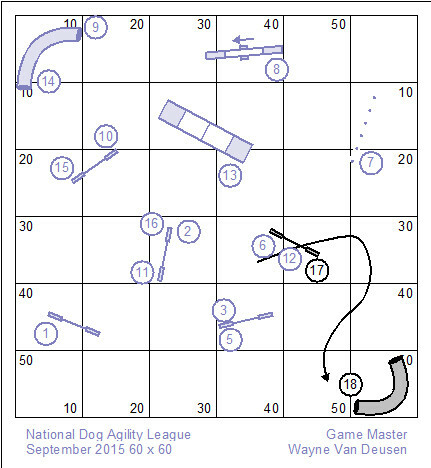 You can even record your own scores with the National Dog Agility League. Download the scorekeeping workbook HERE. Tomorrow morning I’m off to Medford, OR where I’ll lead a single seminar day on Friday, and judge a TDAA trial on Saturday and Sunday. I’m coming home on the red eye on Sunday night. So it should make for an interesting week as I try to recover. I’ve set our league course already so that it’s ready to rock ‘n roll on Monday night. 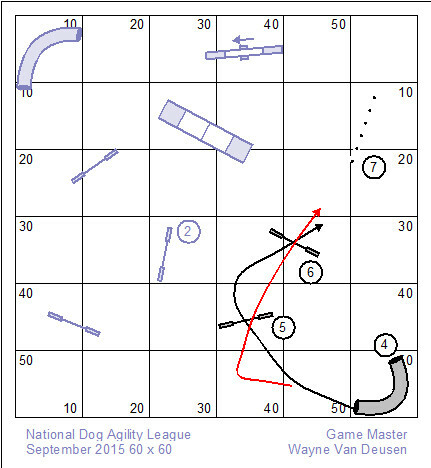 The first back-pass I ever saw in the context of dog agility was probably about 10 or 12 years ago. Stuart Mah was running a nice little Corgi dog, and on the exit of the weave poles he cued the dog to come around him clockwise. All the movement really did for him at the moment is resolve a change of sides at a jump following the poles. He wasn’t forced into rear-crossing the dog at the upcoming jump. I’ve studied the movement now for several years and have pretty much integrated a back-pass into my work in agility. While it only takes about 20 minutes to teach to a dog; the skill is foreign in our collective conscious and understanding of the game of agility. This is lonely work without the benefit of collaborative study of my erstwhile peers. Nobody really understands it yet. The key attribute of the back-pass that I find most appealing is that the dog drops completely out of obstacle focus to curl tightly around the handler’s position. This was my original league analysis: http://wp.me/p2Pu8l-4T. I didn’t actually use the handling that I had originally contemplated. The counter-side foot establishes the direction of the dog’s movement on the finish. And so, it should point in the direction you want the dog to move. The handler should measure the distance to the next obstacle to ensure that the dog has adequate room for that approach. The movement doesn’t have to be a literal 180 turn. The back-pass could be used to indicate the barest turning radius. With that in mind, the handler may rotate as the dog circles around; or the handler may begin the rotation as the dog moves to the handler’s position. The back-pass has none of the “rock-on-a-string” qualities of the Front Cross; and generally will deliver a quicker and neater turn. While the back-pass seems to blend in spirit with the Blind Cross, it is not so “fuzzy” a movement as the Blind Cross; but also does not deliver the quality of acceleration that makes the Blind Cross bold and aggressive. “The key attribute of the back-pass that I find most appealing is that the dog drops completely out of obstacle focus to curl tightly around the handler’s position.” When I say this to people out in the world I look for a light to switch on behind their eyes. I’m disappointed when I don’t see the light. Where there is no light, there is only darkness. 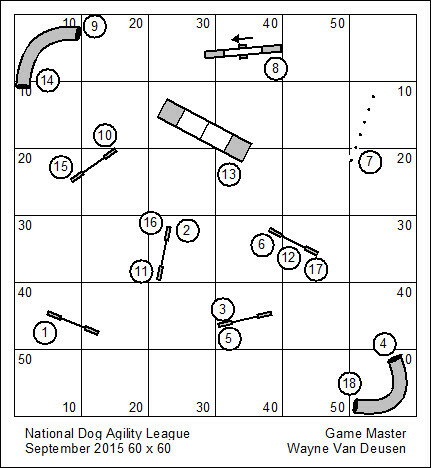 The National Dog Agility League September league course was designed by Wayne Van Deusen. This course features some interesting handling challenges, with a definite international flavor. In my own classes (which attend league play) we spend a bit of time walking through the league course to talk about handling strategies to solve the course we are running. My mission as instructor is ever to teach my students the basic skills to solve the riddles posed by the course designer. The handler is the architect of the dog’s path. And so handling should always begin with a visualization of the dog’s path. Once we set that very basic goal, just about anyone can rummage through the inventory of skills they might have to conduct the dog upon that path. Whether the plan is right or wrong will sort itself out when we test the proposition with a dog in motion (with time-keeper, scribe and judge all playing their part in the drama). These days most of us own some rudimentary approach to a “back-side” jump. Clearly the approach to jump #2 is a managed approach. On this course, however, the back-side is the beginning of a more complicated riddle. Jump #2 actually gives the handler a choice of turning directions. I’m inclined to begin with the natural turning direction as the natural choice unless other factors talk me out of that choice. 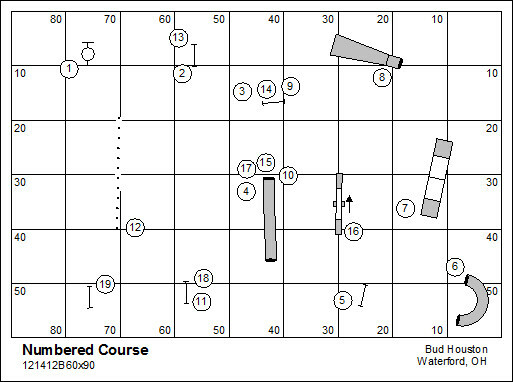 What the drawing shows is that a right turn (which is the natural turning direction) at jump #2 will expose the wrong course tunnel option at #4. Turning the dog to the left at jump #2, as previously noted, fights against the natural turning direction. It also exposes a wrong course option (presenting jump #1 again to the dog). And it also calls for a considerably depressed angle approach to jump #3. But, the consequential path sets the dog up neatly for the correct entry to the pipe tunnel at #4. 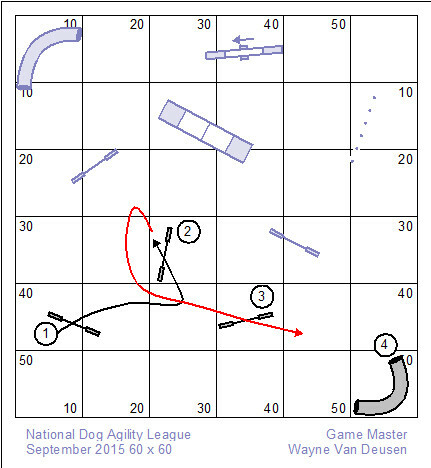 On the dismount of the #4 pipe tunnel the handler might simply attack jump #5 and work to pre-cue the turn to #6. This strategy probably raises the odds of the dog dropping the bar at jump #5, and clearly sets up jump #2 as a wrong course option. 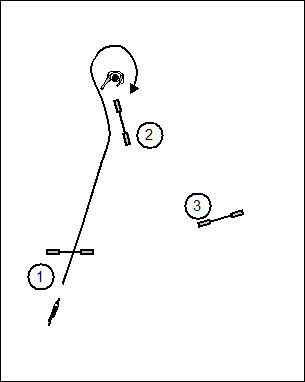 The red line in the diagram shows the handler creating a corner of approach to jump #5 which lines the two jumps up neatly, with a consequential path that carries to the weave poles. This will probably result in a longer path than the “attack jump strategy”, but not much longer. After the excruciating grind of the opening this course opens up into a bit of a helter-skelter romp around and to the A-frame. 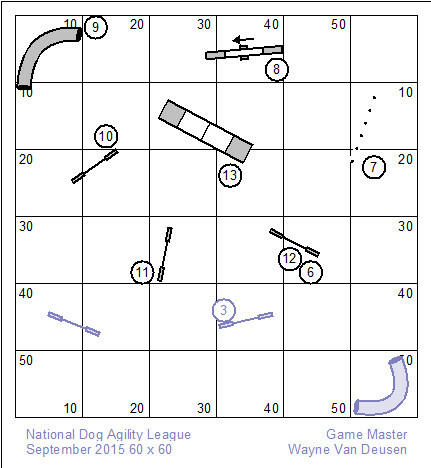 The handler should be aware of the not terribly obvious challenges in this simple part of the course: a) The dog dismounting from the pipe tunnel at #9 needs to be turned to jump #10; b) the #3 jump is exposed as a wrong course option after jump #11; and c) the weave poles are set as a wrong-course option after jump #12. The handler might be advised not to take it all for granted. The interesting turn the course takes here is really a question of the handler’s downfield control position. While the dog is on the A-frame the handler must be calculating how to get in position to handle the closing bit, jump #17 to the pipe tunnel at #18. 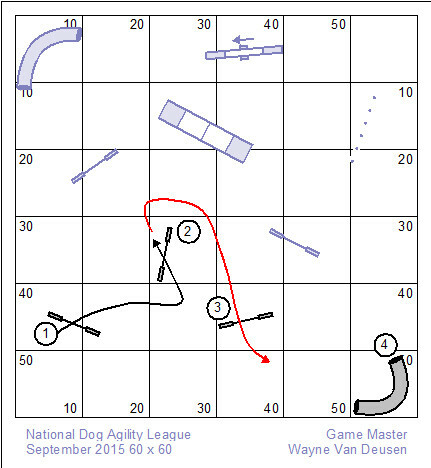 But the handler is obligated to turn the dog out of the #14 pipe tunnel to tag jump #15. And in that moment of prudence the handler might surely sacrifice the forward-of-the-dog control position after jump #17. And the handler should be aware of the wrong course options presented to the dog. The A-frame is surely an option for the dog coming out of the pipe tunnel; jump #3 looms again after jump #16; and the weave poles are somewhat compelling after jump #17. I shouldn’t rule out the possibility of a left turn at jump #17, though to my own thinking it’s crazy and perilous. The right turn clearly opens up the wrong course side of the pipe tunnel. It was clearly not my intention to open the discussion to the handling skills needed to solve Van Deusen’s riddle. Maybe I’ll return to this course after we’ve run it in league play so that I can inventory handling skills that proved to be successful, and some that weren’t particularly so. You are currently browsing the Bud Houston's Blog blog archives for September, 2015.